Makes your ignition system components (ignition module, ignition coil, ignition wires) last much longer. Spark Plug Iridium contact on the copper cored center electrode assures a long change interval. Utilizing an Yttrium Alloy enriched ground strap with copper core, reduces the wearing down of electrodes, greatly increasing the lifespan of the spark plug by preserving the spark gap. The spark plug ground electrode is cut-back to the center of the center electrode which maximizes spark exposure, this helps with cold starts and does not hinder the flame front propagation into combustion chamber. Spark plug Copper core ground electrode provides better heat dissipation from the ground strap - reduces the temperature by about 100 C (212 degree F) which reduces the chance of pre-ignition and detonation, as well as reduce the ground strap hi-temperature burn-off and extending the service life of the spark plug. Copper is the 2nd best conductor of electricity, ensuring minimal loss of energy producing a very potent spark. Special ground strap construction, which is alloyed with Yttrium, reduces the wearing (burning off) of electrodes, and helps displace the accumulated heat more efficiently. Other Manufacturers implement a spot welded Platinum contact point on the ground strap electrode, which does not displace heat very effectively and can potentially lead to pre-ignition and or detonation. The spark plug surface protection Zn/Ni extends the resistance to spark plug corrosion and helps prevent the spark plug from seizing in the cylinder head. The Zn/Ni surface coating is considered the best in the industry. The space between reduced diameter of centre electrode and insulator tip enables a fast evaporation of fuel and prevents formation of soft combustion deposits on the insulator tip of the spark plug. The cylindrical ending of spark plug insulator tip enables very fast achievement of spark plug self cleaning temperature after engine start. The ceramics mass with high content of AI2O3 with increased dielectric strength of the spark plug. The copper core of centre electrode increases the thermal conductivity and therefore it enables the insulator tip elongation by sufficient thermal value reserve of spark plug. 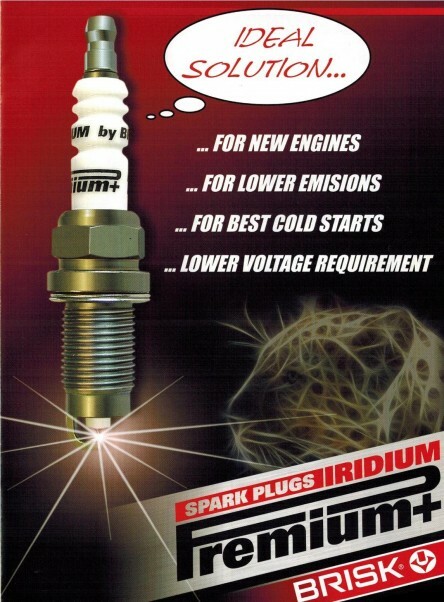 Want to get a set of our Brisk Premium Iridium Performance Spark Plugs for your vehicle or racing application? Not sure what part you need, No Problem! Send us an email at info@briskusa.com or give us at (713) 459-6977 for product selection assistance, we have a full support staff to help you find the right product for your vehicle today. If you prefer to do it yourself, visit our online store and utilize our part finder, enter your vehicle Year, Make, Model and choose the correct engine and it will recommend a few of our products that are applicable to your vehicle!